since my tofu stir fry was a bit of a flop last week, i decided i’d go with something a little more familiar this time, something that would be more of a “sure bet” for my taste buds and preferences. i was flipping through my notebook and came upon this slow cooker recipe for sausages, sauerkraut, and potatoes. anything in a slow cooker is a great idea, and since it was a recipe from a torn-out page of real simple magazine, i knew it’d be a success. as i was unlocking the door to the condo, i could smell the delicious wafts seeping through the poorly insulated frame right to my nose. the meal is as scrumptious as it sounds and looks. the potatoes are perfectly cooked, not overdone. the bratwursts are almost crumbly, and the sauerkraut is to die for. 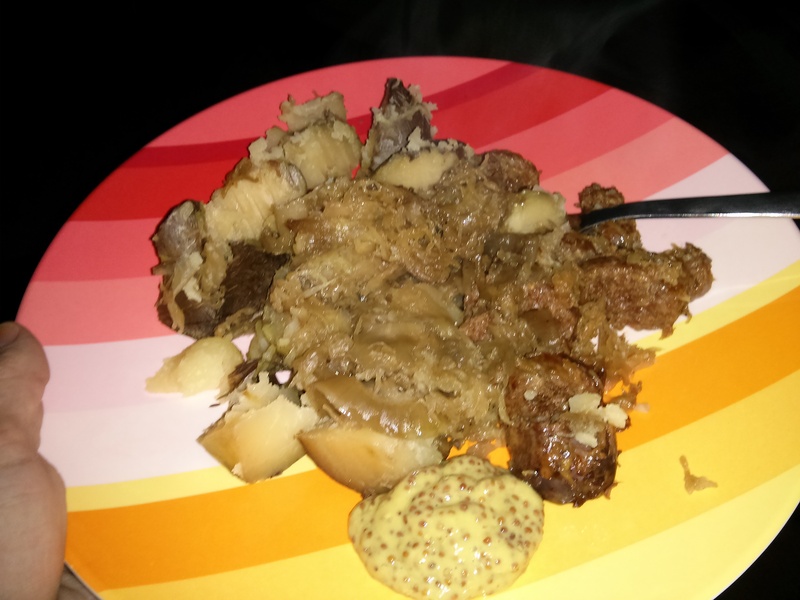 personally, i only needed a little bit of the whole grain mustard, but it does give a nice little bite to each forkful. if you’re a german food-lover, this recipe is for you. enjoy!